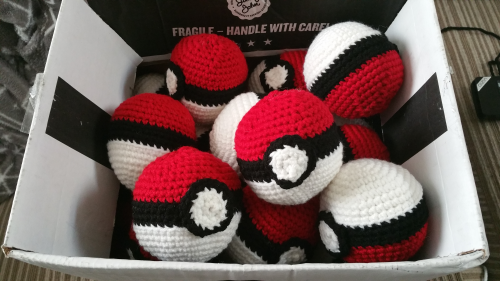 Crochet Mae » Halloween Pokeballs! Each year for Halloween I make a small crochet happy to pass out to the trick or treaters. With the success of Pokemon Go and Pokemon mania in our house for Pokemon Sun and Moon, I decided to make more Pokeballs. I had made some back when we went to Gen Con. In all I made 21 Pokeballs. My goal was 30 but fell short. I had made them in stages – doing all the white first for 30 then adding the black, etc. We had one left over and I plan to finish the rest for Pax South in January.